Mountain City serves as the county seat of Johnson County, and it is the northeastern most county seat in Tennessee. It is the highest incorporated city in the state at an elevation of 2,418 feet. The town has a total area of 3.3 square miles, all being land. The town is situated in one of the highest valleys in the state. Forge Mountain rises to the east, Doe Mountain rises to the southwest and Iron Mountains rise to the north. Mountain City is just a few miles from both the Virginia and North Carolina state lines. US Hwy 421 connects Mountain City with Bristol, Tennessee, to the northwest and Boone, North Carolina, to the southeast. State route 67 winds along side Watauga Lake and connects the town to Elizabethton, Tennessee. Mountain City has a Post Office with an assigned zip code of 37683. The town is part of the voting district #7 area of the county, and the residents of this community vote at the Johnson County High School. The first Euro-American explorers arrived in what is now the Mountain City area in the late 17th century using existing Native American trails. The first permanent Euro-American settlers arrived in the 18th century and among them were Leonard Shoun and Alexander Doran. The town was founded in 1836 and was originally called Taylorsville, in honor of Colonel James Taylor. 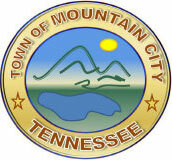 The name was changed to Mountain City in 1885, to reflect it being in one of the highest valleys in Tennessee. Mountain City and Johnson County have a long musical heritage. In 1925, the town was the site of the first Mountain City Fiddlers Convention, which is considered a landmark event in the modern history of Appalachian traditional music. The musical gathering greatly contributed to the development of the genre of country music. It is celebrated every year at the Old Time Fiddlers Convention in nearby Laurel Bloomery.